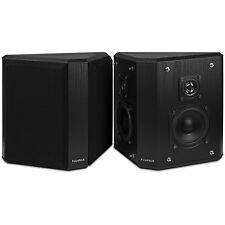 The Fluance SXBP2 Bipolar Surround Sound Speakers offer an energetic and enticing performance with superior components that enhance the cinephile experience. From every high speed locomotive to the ferocious jet plane flight, these bipolar speakers will reinforce the movie theater experience you dream about. Bipolar Surround Sound Design The unique configuration of the bipolar speakers creates a 3D soundstage. This is achieved by having two complete full-range speaker systems on opposing sides of the cabinet. The results are widespread, enveloping surround sound throughout your room. The SXBP2 are designed for placement beside or behind the listeners for an extremely convincing 5. Strong wall brackets for drywall screw. Polyester fabric covers. 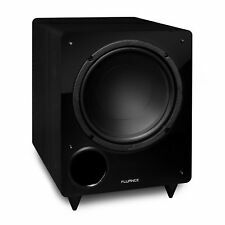 Fluance Signature Hi-Fi Bookshelf Speaker, Pair, in black (gloss black baffle, black ash cabinet). The Fluance ES1 Higher Fidelity Floorstanding Pillar Loudspeakers are a revolution in design and performance that have been tailored to your audio needs. Condition is Used. Every breathtaking acoustic performance will awaken your ears to the brilliant high-frequency sounds reproduced by the ES1 Floorstanding Pillar Loudspeakers. Welcome to an evolution, a revolution and the next big innovation in home audio. The Fluance Fi70 Wireless High Fidelity Music System is more than just a speaker - it is a musical Phenom designed for one reason, true audio enjoyment. From the widely accomplished frequency range, to the head turning esoteric design, the Fi70 is the ultimate music system. It is large, it is loud, and the Fi70 will replace a complete home stereo system for concert rivaling performances. Audio Excellence Dedicated from day one to create the best audio products in the industry, the Fi70 was engineered to recreate the tracks you love with harmonious perfection. Truly immersive three-dimensional sound in the comfort of your living room. The Signature Series Bipolar speakers create an amazingly convincing surround sound experience you would expect in a movie theater. Whether enjoying movies or binge watching your favorite TV shows, these bipolar speakers will ensure you are in the middle of the action. So grab some popcorn, sit back, and enjoy. Focus on Sound Excellence The Fluance Signature Series is a powerhouse in home audio. From the powerful midrange, to the ultra-high end tweeters, these speakers are the result of years of meticulous engineering. Prepare for a home theater experience like no other. Serious sound, from helicopter blades, to bullets flying by, the Fluance Signature Series Surround Sound Speakers will encapsulate you with everything you could expect from your movies and more. Focus on Sound Excellence The Fluance Signature Series is a powerhouse in home audio. From the powerful midrange, to the ultra-high end tweeters, these speakers are the result of years of meticulous engineering. With a focus on sound excellence, every detail has been measured, tested, and perfected to recreate even the finest audio details with crystal clear accuracy. Only had it for a few months, there are no scratches and it is in excellant condition. The Fluance DB12 Powered Subwoofer is ready to rock your body with a powerful bass performance empowering you to become truly immersed in any music or movie experience from a mesmerizing bass guitar solo to a ground shaking movie explosion. Summon the Power of the Low Frequency Gods Enjoy extraordinary performance in your home theater adventures with the Fluance’s flagship subwoofer. While most recordings contain bass frequencies that traditional speakers cannot easily reproduce, the DB12 is designed specifically to reproduce those ultra-low bass frequencies - an integral part of any home theater. Strap yourself in to experience the ultimate musical freedom while enjoying a stunning room-filling sound performance with the Fi20 Omni-Directional Portable Wireless Speaker. Grab and go to enjoy 360-degrees of sound everywhere from your man cave, to your sizzling summer BBQ. Every Spot is the Sweet Spot While most speakers are directional, the Fi20 radiates music in every direction so no matter where in the room you are, you hear exceptionally detailed sound. The acoustic dispersion design emits a powerful omni-directional sound with vibrant highs, clear mids, and rich bass to put you in the center of the concert no matter where you are. The Signature Series 7.1 Surround Sound System is designed to encapsulate you with every sound the way the artist intended. This complete home theater system includes floorstanding tower speakers delivering full range sound, a center channel speaker to accentuate crisp vocals, surrounds and rear surrounds for multi-directional sound, as well as a powerful 12” subwoofer to reproduce ultra low frequencies for an immersive cinematic and music experience that is not just heard, but felt throughout your entire body. Focus on Sound Excellence The Signature Series is a powerhouse in home audio. This speaker system is the result of years of meticulous engineering. 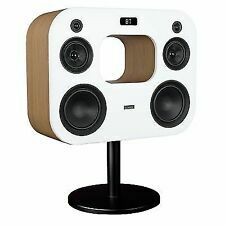 HiFi Center Channel Speaker with integrated wall mounting brackets (keyhole slots). Mastering precision and sonic accuracy, the Signature Series uses only premium components that ensure high fidelity sound transporting the theater into your living room. Fluance believes everyone should experience audio in it truest form, never more true than with the AB40 High Performance Soundbase. The ultimate audiophile quality solution for those in search of home theater performance without the space for multiple speakers, amplifiers and wiring. The AB40 is designed for placement under your TV and provides a cinema performance guaranteed to surpass your expectations. Truly Convincing Surround Sound Exclusive Fluance 3D sound uses Grammy Award winning sound processing technology which creates an immersive listening experience. 3D mode digitally enhances the sound, widening the soundstage for an enveloping in-home theater experience. The Fluance SXHTB Surround Sound Home Theater System delivers radiant and engaging performances with a skillfully matched five speaker surround sound system. The premium components ensure sound reproduction that will exceed audiophile expectations. From the powerful solo excursions to the defined lyrics, the floorstanding towers, surrounds and center channel harmonize for genuine listening experiences. Speakers Matched to Your Lifestyle The soundtrack of your life is ambitious. 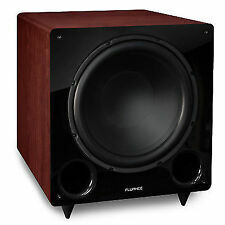 So is the Fluance SXHTB Surround Sound System. When the SXHTB is used in Dolby surround and DTS systems you can truly hear what home theater is supposed to be. The Elite Series Compact 5.0 Speaker System delivers radiant and engaging performances with a skillfully matched 5-speaker surround sound system. The premium components ensure sound reproduction that will exceed audiophile expectations. From the powerful solo excursions to the defined lyrics, the bookshelf speakers, surrounds, and center channel harmonize for genuine listening experiences. Speakers Matched to Your Lifestyle When the Elite System is used in Dolby surround and DTS systems you can truly hear what home theater is supposed to be. FREQUENCY RESPONSE GRAPH. 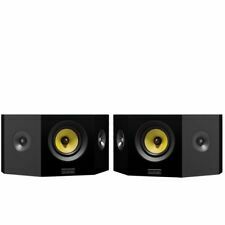 Two Rear Surround Sound Speakers with Integrated Wall Mounting Brackets (keyhole slots). WHAT'S INCLUDED. SENSITIVITY86dB @ 2.83V / 1m. SUBWOOFER OUTPUTNo. CERTIFICATIONSCE Certified, RoHS. What do you expect from your speakers? How about the emotion and intensity of a live performance in the comfort of your own home? The Fluance XL7F High Performance Three-way Floorstanding Loudspeakers are engineered with premium components that skillfully cater to your audio needs. From the highest symphonic crescendos to the deepest smoothest jazz to a movie’s spine-chilling sound effects, once you experience our stunning sound we think it will be the beginning of a very special relationship. These aren’t just speakers. They’re a lifestyle. The soundtrack of your life is ambitious. The Elite Series 5.1 Speaker System delivers radiant and engaging performances with a skillfully matched 5-speaker surround sound system. The premium components ensure sound reproduction that will exceed audiophile expectations. From the powerful solo excursions to the defined lyrics, the floorstanding towers, surrounds, center channel, and subwoofer harmonize for genuine listening experiences. Speakers Matched to Your Lifestyle When the Elite System is used in Dolby surround and DTS systems you can truly hear what home theater is supposed to be. The Fluance SXHTB-BK Surround Sound Home Theater System delivers radiant and engaging performances with a skillfully matched five speaker surround sound system. The premium components ensure sound reproduction that will exceed audiophile expectations. From the powerful solo excursions to the defined lyrics, the floorstanding towers, surrounds and center channel harmonize for genuine listening experiences. Speakers Matched to Your Lifestyle The soundtrack of your life is ambitious. So is the Fluance SXHTB-BK Surround Sound System. When the SXHTB-BK is used in Dolby surround and DTS systems you can truly hear what home theater is supposed to be. The Signature Series is a powerhouse in home audio. This speaker system is the result of years of meticulous engineering. With a focus on sound excellence, every detail has been measured, tested, and perfected. As Powerful as Tower Speakers Not your typical surrounds, these speakers can also be utilized as bookshelf speakers or fronts. They provide superior performance at every volume level with outstanding precision and clarity, allowing you to soak up all the dramatic impact your movies and music can deliver. The Elite Series Compact 5.1 Speaker System delivers radiant and engaging performances with a skillfully matched 5-speaker surround sound system. The premium components ensure sound reproduction that will exceed audiophile expectations. From the powerful solo excursions to the defined lyrics, the bookshelf speakers, surrounds, center channel, and subwoofer harmonize for genuine listening experiences. Speakers Matched to Your Lifestyle When the Elite System is used in Dolby surround and DTS systems you can truly hear what home theater is supposed to be. This is a very nice pair of high-fidelity surround sound speakers in mint condition. Produces clear, crisp sound. 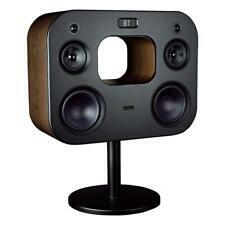 Three Fluance AVHTB Speakers Center and Surround A1103020140. Two Surround Speakers. Three of a Five Speaker Set. One Center Speaker. Open your mind to the possibility of a truly pure listening experience. The Fluance Signature Series Hi-Fi Floorstanding Speakers will transport the concert into your living room. Not for the faint of heart, these speakers can outperform the band themselves. Focus on Sound Excellence From the 8" woofers, to the ultra-high end tweeters, to the premium midrange drivers, these speakers are the result of years of meticulous engineering. With a focus on sound excellence, every detail has been measured, tested, and perfected to recreate even the finest audio details with crystal clear accuracy. Bass so powerful you will get goosebumps. The Fluance DB10 Subwoofer offers cinematic, room shaking bass for a truly immersive experience bringing your movies and music to new depths. Add Power to Your Home Theater Smooth, precise and explosive, the DB10 will change the way you spend your Saturday nights. Feel the punch of a kick drum, or explosion of an action movie right in your core. While most recordings contain bass frequencies that traditional speakers cannot easily reproduce, the Fluance DB10 is designed specifically to reproduce those ultra-low bass frequencies - an integral part of any home theater. From enchanting lyrics to captivating monologues, greatness deserves to be experienced purely. The Fluance Signature Series Hi-Fi Center Channel Speaker will perfect the vocals and dialogue of your favorite music and movies ensuring you are in the center of the action. Focus on Sound Excellence The Fluance Signature Series is a powerhouse in home audio. From the powerful midrange, to the ultra-high end tweeters, this speaker is the result of years of meticulous engineering. With a focus on sound excellence, every detail has been measured, tested, and perfected to recreate even the finest audio details with crystal clear accuracy. The Reference Series 5.0 Compact Surround Sound System encapsulates you with every sound the way the artist intended. This home theater system includes bookshelf speakers delivering full range sound, a center channel speaker to accentuate crisp vocals, and rear surround speakers creating a multi-directional sound allowing you to experience the highest symphonic crescendos to the deepest smoothest jazz. Not Just Speakers. They’re a Lifestyle. This speaker provides superior performance at every volume level with outstanding precision and clarity, allowing you to soak up all the dramatic impact your music and movies can deliver. Fluance uses high-performance drive nuts, advanced enclosure technologies and highly refined crossovers to achieve all new standards in sound performance and technological design excellence. The results are clean, un-distorted bass, smooth response throughout the midrange, exceptional high frequency resolution, and pinpoint imaging that everyone can appreciate. Condition: Acceptable. Expected wear with age otherwise good. Height: 39.5". The Fluance SXHTB-BK Surround Sound Home Theater System delivers radiant and engaging performances with a skillfully matched five speaker surround sound system. The premium components ensure sound reproduction that will exceed audiophile expectations. From the powerful solo excursions to the defined lyrics, the floorstanding towers, surrounds and center channel harmonize for genuine listening experiences. Speakers Matched to Your Lifestyle The soundtrack of your life is ambitious. So is the Fluance SXHTB-BK Surround Sound System. When used in Dolby surround and DTS systems you can truly hear what home theater is supposed to be.